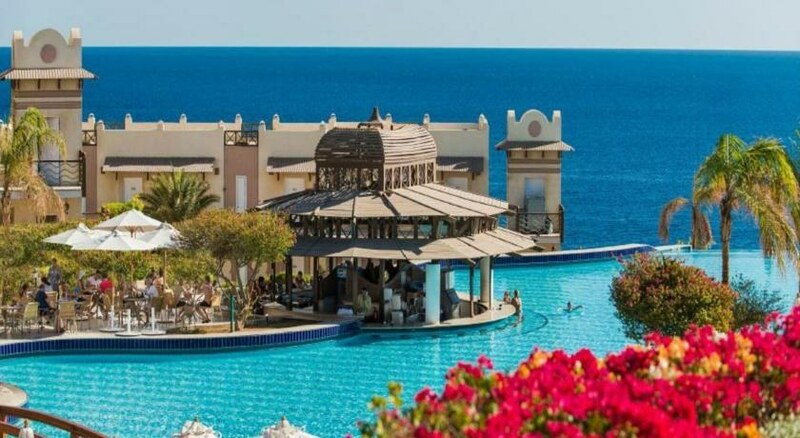 The Concorde El Salam Hotel Sharm El Sheikh has a lovely location on the southern tip of the Sinai Peninsula, Egypt, overlooking the Red Sea and Gulf of Aqaba. There are 725 welcoming rooms and suites of various styles at the Concorde El Salam Hotel which consists of a main beachfront hotel with 423 rooms and a separate Sports hotel building with 302 rooms. Guests are spoiled for choice with terrific Spa & Health facilities, 6 swimming pools, a Sports Centre, great dining and bar options, a nightclub and hosted live entertainment shows. Children are well catered for with a Club and activities, pool and babysitting service. 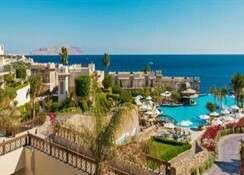 For a fabulous holiday book into the 5-star Concorde El Salam Hotel Sharm El Sheikh and enjoy Egyptian hospitality. Food, drink and entertainment: Laguna & Terrace Restaurant with Red Sea views offers buffet-style breakfast, lunch & dinner, Waterfall Restaurant offers daily buffet and international cuisine with a BBQ station, L''Italiano with Red sea views for Italian cuisine, Piano Bar overlooking infinity pool, Lobby Bar near the sports complex offers light snacks and music, Pool Bar, Island Pool Bar & Aqua Gym Pool Bar, Oriental Cafe with large terrace, Normandy II nightclub with disco bar, international music and live shows by the in-house entertainment team. Sport, games and activities: 6 swimming pools (winter heated), sun terraces and gardens, loungers & parasols, 2 health clubs including sauna, massage, Jacuzzi, Turkish bath and gymnasium, 2 beauty centres, 2 games rooms, 2 squash courts, 3 tennis courts, international size football pitch, diving & water sport centre, horse riding tracks, marine trips, volleyball, billiards and ice skating at the only rink in Sharm El Sheikh. For the kids: Children''s swimming pool, playground, Children''s Club with daily entertainment; babysitting service. Additional: 24 hour Front Desk services, housekeeping, room service, sightseeing arrangements, tickets confirmation, booking & rentals, transportation available from front to back hotels (15 minutes), Business Centre: internet access, secretarial services, typing service, copy/print/fax/scanning service, PC rental, mobile phone rental, video & DVD rental, web camera, a choice of 6 event rooms for meetings, banquets & conferences holding up to 250 people with A/V equipment available and high-speed internet access, on-site shops include a bank, pharmacy, supermarket, gift shop, jewellery shop and bazaar. Guest rooms and suites have a warm and inviting decor of soothing shades, Egyptian-style drapes and fabrics, cool tiled floors with rugs, comfortable furnishings and modern conveniences; features include pool, garden or sea views with a supplement, air-conditioning, private bathroom with hair dryer & toiletries, satellite TV, direct dial telephone, mini fridge, luggage rack, safe and complimentary water on arrival. Deluxe rooms enjoy extra living space and a balcony or terrace, as do the suites which have extra furnishings and rooms accordingly. All Inclusive: The All Inclusive information is a guide only and may be subject to change and/or availability. Buffet breakfast, lunch and dinner with live cooking stations in the main restaurant. Snacks available. Domestic brand alcoholic and non-alcoholic drinks by the glass including beer, wine, spirits, soft drinks and water by the glass available. Afternoon tea and coffee. Snacks and cakes available from 16:00-18:00. The beach front hotel is approximately ten minutes from the Sharm El Sheikh international airport. The Double Standard room (Economy) of Concorde El Salam Resort is located into the Sport area of the hotel , located 500 m from the beach ( shuttle bus available free of charge).